Now, meditation can be made easier to practice than before, due to the rise of tools such as Headspace.com. Given this trend, along with the general rising interest in biohacking and cognitive improvement, it is interesting to examine cognitive benefits of meditation apart from mood-related improvements. The current consensus is that meditation helps with elevating the mood, but there currently is not as much (scientifically rigorous) evidence that meditation increases other aspects of cognition like intelligence or attention span. There's a decent amount of interest in the science community on meditation. Currently, there are 536 studies registered on ClinicalTrials.gov that study meditation as an intervention. A majority of these studies are examining the effects of meditation on stress and anxiety, in either patients without other comorbidities, or patients with diseases such as multiple sclerosis, congestive heart failure, and cancer. We've heard a lot about meditation's effects on stress and anxiety, but intelligence is another interesting facet and the scientific research around it seems promising. In a study involving two twins, it was suggested that mediation increased the intelligence quotient (IQ) of participants by an average of 23 points after performing the meditative tasks during 40 separate sessions of therapy. 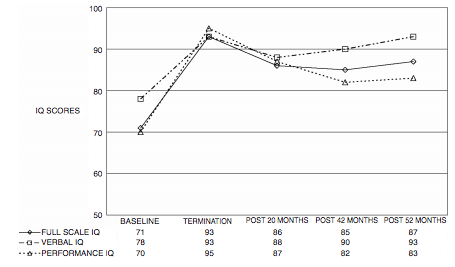 IQ was measured by the WISC-III test for intelligence.4Most of the benefits actually lasted for a period of up to 52 months after the intervention, which is interesting (see chart below). Note that all participants in this study, started with lower than average IQ (as low as 60-70), and had their IQ raised to near-average levels. A similar change in IQ points may or may not persist in participants starting out with her IQ scores. In a brain imaging study, it was found that occipitotemporal lobe thickness was correlated with the slowed breathing rates during meditation, as found with functional MRI. What will be important to delve into for future research is to tease out the effects of meditaiton, on both fluid intelligence (ability to solve novel problems in new situations) and cyrstallized intelligence (ability to use knoweldge one has already attained). It's been indicated before that meditation can improve fluid intelligence. Furthermore, there is a very limited body of knowledge on the effects of meditaiton on intelligence. Meditation is made easier for the public to do these days due to tools such as Headspace.com. Due to its popularity there are many off-hand anecdotal accounts of people improving their mood, courage, productivity, and even IQ with it. However, it should be noted that the effect of meditation on these measures hasn't been studied widely in a scientific manner. Given that 8% of Americans adults meditate, however, this does make for an interesting field of future reseach, however. Everly Jr, G. S., & Lating, J. M. (2012). A clinical guide to the treatment of the human stress response. Springer Science & Business Media. Davanger S., Eifring H. & Hersoug A.G. (2008) Fighting stress: reviews of meditation research. Fleischman, M. J., & Othmer, S. (2006). Case study: Improvements in IQ score and maintenance of gains following EEG biofeedback with mildly developmentally delayed twins. Journal of Neurotherapy, 9(4), 35-46. Lazar, S. W., Kerr, C. E., Wasserman, R. H., Gray, J. R., Greve, D. N., Treadway, M. T., ... & Rauch, S. L. (2005). Meditation experience is associated with increased cortical thickness. Neuroreport, 16(17), 1893.